We’d love your help. Let us know what’s wrong with this preview of All We Could Have Been by T.E. Carter. Treated like a criminal herself, Lexie now moves from school to school hiding who she is—who she's related to. She struggles with loving her bro Five years ago, Lexie walked home from school after her older brother failed to pick her up. When she entered her house, her brother sat calmly, waiting for the police to come arrest him for the heinous crime he had just committed. To ask other readers questions about All We Could Have Been, please sign up. I miss what we were, but we aren't that anymore, and it's better to get away from the memories of all we could have been. I wanted to love this so much. Carter's I Stop Somewhere hit me so hard last year that I listed it among my favourite books of 2018. This one just didn't come close to affecting me in the same way. There are several reasons, and I think one is that I Stop Somewhere alternates between the past and a present which is told in a very poetic and unique writing style. All We Could Have Been is less experimental, more of a traditional high school novel about a new girl with a dark past, a blooming romance, and unfair rumours flying everywhere. I just recently read a book that did a similar thing - The Burning - and I actually enjoyed that one more. The characters' voices here also seemed on the younger side for high school seniors. By my understanding of the American school system, that should put them at 17-18 years old, and yet they read a good 4 or 5 years younger to me. It didn't help that Lexi never seemed to develop her own distinct personality. Everything is about how she reacts to everyone else, and what they feel. It was difficult to transport myself into her mind and world. Lexi starts a new school with a new name, in order to run away from the stigma of her brother's crimes. The first half of the book is slow, and is largely made up of daily school life-- making new friends, auditioning for the school play, and some vague hints about what her brother might have done. It was really difficult to get interested in the plot. The only real driving force of the narrative was the mystery around Lexi's brother, and it is just not that exciting. The second half of the book is what happens when people at her new school find out. This is more dynamic, but I feel like I've read many versions of this story, and many of them were better. If you're looking for something similar, you could try the aforementioned The Burning, or even better, just read an early Courtney Summers's book like Some Girls Are. I was also unimpressed by the direction the romance took. It's a really big pet peeve of mine when a character's journey to self-acceptance is fuelled by a romance, and here Lexi relies on Marcus to explain why everything is not her fault and alleviate some of her anxiety symptoms. There were some things I did like. I liked how things were resolved with Chloe, and that the book had asexual rep. There were some interesting ideas about morality, complexity and judgement. Rory, especially, had the potential to be such an interesting character-- I’d really love to see a book about a Rory type; someone who is so concerned with abstract morals that they forget the moral complexity of human beings. One last thing - and this is a genuine question, not a criticism - does the thing with Scott's hearing really happen? Do law professionals truly ask 17 year olds if their incarcerated family member is capable of rehabilitation? If they do, that is messed up. A) why they would put a minor through that? and B) why they would take the opinion of a criminal’s little sister into consideration when deciding his future? Genuinely curious about this. CW: depression; anxiety/PTSD; self-harm; (view spoiler)[murder (hide spoiler)]. All We Could Have Been is a genuinely absorbing and very emotional novel, with themes of grief and sense of self, looked at from a different and extremely compelling angle. Lexi is a layered and engaging character to follow along with, as she once again attempts to start anew- despite herself she starts to hope, to integrate, but her reality is never far behind her and facing the unknown can be a dark path indeed. I loved the levels of this story, one in which coming of age is a more than usual ch All We Could Have Been is a genuinely absorbing and very emotional novel, with themes of grief and sense of self, looked at from a different and extremely compelling angle. I loved the levels of this story, one in which coming of age is a more than usual challenge. Lexi doesn’t know how to define herself beyond that which her Brother did, a horrific act revealed in stages through her narrative. Her coping mechanisms are many but how can you be yourself when all anyone see’s is that one deeply disturbing event, when they wonder about your own personal demons, when acceptance is non existent. This then is what she faces, what I loved about this one was the pure authenticity of it, the harsh realities of living a life in someone else’s shadow. The author doesn’t mollycoddle but does offer hope through the people Lexi meets, sometimes that hope is justified sometimes not, but in the entirety of the story there are no easy answers, no palatable closures but genuine possibilities. If you want complete answers or a neatly wrapped up tale this won’t work for you but if you like to be pushed into thinking outside the box, if you want thought provoking storytelling with strong yet honestly flawed characters then All We Could Have Been should definitely be on your reading radar. - There is, of course, Marcus – who is supposed to be this bad boy with a horrible reputation, when all he really seems to be is a kid who did what he had to do to survive and ended up getting swept under the rug by the school system. - Ryan is Lexie’s first real friend at her new school, and he has a secret too, but one that’s entirely personal. (view spoiler)[Ryan is asexual, which has caused him some grief at school and is something he really struggles with. He has come to accept it about himself but isn’t ready to be public about it. (hide spoiler)] I really like Ryan, until about the middle of the book, when he does something that seems entirely selfish and unreasonable and very out of character, IMO. Meh. - Chloe – Chloe is somewhat petty and self-centered, but she has a respect for human feeling that a lot of people don’t. I can respect her, in the end, even if I didn’t really like her. - Aunt Susie – I love adult characters that I can empathize with. This is probably less of a big deal for the intended audience of All We Might Have Been, but as an adult reader I totally felt a kinship with her. She is Lexie’s mother’s sister, and while she is trying to be the “parent” figure Lexie’s parents want her to be, she ends up treating Lexie more like an adult. Huge props. After her brother committed a violent crime, Lexi's entire life changed. For the past 5 years, Lexi has moved several times to live with various relatives once people discovered what her brother did. Now, living with her Aunt, she is determined to stay in one place for her senior year of high school. What an interesting book. It’s about a girl who lives with the grief, shame, and trauma inflicted on her by her brother’s crime. It’s a good look into how each of us lives with the crimes committed by others. T.E. Carter's I Stop Somewhere was striking and intense, and also the reason I highly anticipated All We Could Have Been . I didn't expect a replica of Carter's first novel, but something that evoked the same feelings. Something that made me stop and think. All We Could Have Been did the opposite. Alexia moves in with her aunt after five years of living with different relatives. Her brother committed a heinous crime when she was 12, and it shattered their family. Her parents sold their house T.E. Carter's I Stop Somewhere was striking and intense, and also the reason I highly anticipated All We Could Have Been . I didn't expect a replica of Carter's first novel, but something that evoked the same feelings. Something that made me stop and think. All We Could Have Been did the opposite. Alexia moves in with her aunt after five years of living with different relatives. Her brother committed a heinous crime when she was 12, and it shattered their family. Her parents sold their house and moved into a condo, her brother went to jail, and Lexi temporarily lived with a family member until someone discovered her secret at school and the harassment started. Then she vanished, relocating to a different state with a new relative and a new name. She's determined to remain in one place for her senior year and knows her aunt is her last option before heading back to her parents. She meets two boys on her first day of school and is instantly attracted to both for different reasons. Marcus is the dark and brooding bad boy who has class with other lost causes at their school. Ryan is quiet and sweet and instantly chauffeurs Lexi into his world of drama club with his voracious friends Rory, Lauren, and Chloe. From here the repeated cliches start that I've read hundreds of times. Chloe likes Ryan but Ryan doesn't like her, despite the two of them dating in the past for a short time. Rory is an advocate for injustice with a second passion for drama. Lauren doesn't have any attributes, she's just a placeholder that is initially friendly to Lexi. Lexi and Ryan grow closer as the months progress while Chloe simmers in the distance, shooting daggers at Lexi for moving in on her territory. Except Lexi realizes she doesn't like Ryan that way. She likes Marcus despite hanging with him twice in a matter of two months. Ryan informs Lexi one day that he's told all their drama friends that they're dating, without Lexi's consent. Lexi doesn't seem to care, and agrees to fake date him so everyone thinks they're a pair when in reality Ryan is asexual and wants Chloe to leave him alone while Lexi is sleeping with Marcus. Months pass, Lexi hangs with her new friends, earns a small part in a play, and life is good. She hangs with Marcus and they both talk about their horrible lives and past memories. Then Lexi decides to tell her new friends about her past and what her brother did; something she's never done before. The results are the same despite Lexi calling all the shots; her so called friends ditch and turn against her and so Lexi retreats to Marcus who remains faithfully by her side. The story was okay up until this point. After she tells everyone her secret, Ryan becomes angry that Lexi never told him first since they're best friends. He claims that his life has sucked for years and now the student body is going to focus on him and the last thing he wants is for his secret of being asexual to get out. When did Lexi's secret have anything to do with Ryan and his sexuality? It didn't. Ryan manipulates Lexi into being ashamed for not thinking of him before she bravely told everyone her past. I lost all respect for Ryan at that point. He needed to grow up, push his problems aside, and be the "best friend" he claims to be to Lexi after she just confessed something difficult. Instead he makes it about him because apparently the school is going to harass him and somehow discover he's asexual and then bully him despite Lexi only telling everyone the awful crime her brother committed. I'm still not sure how that relates to Ryan. No one is going to give him the time of day when they're gossiping about Lexi. Like Ryan, Rory's true colors also come out from hiding as she turns on Lexi, belittles her every chance she gets, and harasses her by sticking news articles and flyers on Lexi's locker and everywhere in the school. Why didn't the principal interfere at this point? Why didn't he put a stop to Rory's bullying? The whole school turns against Lexi and I don't understand why. Lexi was a kid when her brother did what he did. She had no part in it. She and her family live with enough guilt, shame, tragedy, and depression everyday because none of them knew what their son/brother was capable of. Lexi is a different human being than her brother. Why did no one get this? Even Lauren asked Lexi why she wasn't suffering and sad enough after knowing what her brother did. That is none of Lauren's business. She shouldn't be making assumptions and judging based on her own limited knowledge. How dare she tell someone how they should feel in the wake of trauma. The next issue is Lexi latching onto Marcus and making him her anchor. Sure, he supports her and understands who she is because of her past and that's wonderful, but that's the thing. Lexi shouldn't place him on a pedestal and make him her reason to get up each day and live. Relying on someone else isn't going to heal you. You have to heal yourself and not base your emotions on a person that could disappear the following day. Marcus can be there for Lexi and support her, but the story would have been stronger if Lexi had been more independent and found a healthy method of coping instead of turning Marcus into her rescuer. Life isn't a fairy tale. No one is going to rescue you when you're kicked down to the ground and screaming for mercy. You have to learn to put on armor, sharpen your sword, stand back up, and fight for yourself. How would you handle it if you had to move each year because people kept finding out your past? Alexia has a secret that haunts her, that brings along crippling flashbacks, and that causes anyone who finds out about it to ridicule and ostracize her. Now, just trying to finish high school in yet another new town, she meets two boys, Marcus and Ryan. One becomes a fast friend and one becomes something more. Lexi longs to overcome her past and open up about it, but what happens if she actually does? How would you handle it if you had to move each year because people kept finding out your past? Alexia has a secret that haunts her, that brings along crippling flashbacks, and that causes anyone who finds out about it to ridicule and ostracize her. Now, just trying to finish high school in yet another new town, she meets two boys, Marcus and Ryan. One becomes a fast friend and one becomes something more. Lexi longs to overcome her past and open up about it, but what happens if she actually does? Will it be just another dismal end to a year in a new place, another failed new beginning? Or might this place, with these people be just the opportunity for healing that she so desperately desires? I was provided a review copy via NetGalley in exchange for an honest review. The only thing that kept me reading was the premise which ended up being very one dimensional. It also bothered me that the dialogue in this was very robotic. Not a fun time! Lexi has been running for five years. Ever since she came home that day after school and watched her brother being taken away by the police. When people see her now, all they see is what her brother did. They say Lexi has the same thing inside of her and aren't very nice about it. Hoping to start over again, she moves in with her Aunt for senior year. No one knows who she is here and she wants to keep it that way! It's clear that pretending is leaving a mark on Lexi. She has lots of anxiety, does Lexi has been running for five years. Ever since she came home that day after school and watched her brother being taken away by the police. When people see her now, all they see is what her brother did. They say Lexi has the same thing inside of her and aren't very nice about it. Hoping to start over again, she moves in with her Aunt for senior year. No one knows who she is here and she wants to keep it that way! It's clear that pretending is leaving a mark on Lexi. She has lots of anxiety, doesn't want to get too close to people, has to wear a certain color on a certain day and she's afraid to let slip who she really is. This author really wrote this so well. I felt all the emotions Lexi was going though! Her grief not only for what happened to her brother who was her best friend, but the question if she could've known it was going to happen? All Lexi wants is to feel normal. She feels guilty for feeling that way though. Why should she live normally when the family her brother devestated is left picking up the pieces. Especially when people find out and start looking at you differently, blaming you, thinking you'll do the same thing. I thought the author described this well. In the world these days, people are so easy to judge. Your family member did something, so you automatically are the same. It's so unfair to Lexi, because they don't even want to see what she's going through. It was nice seeing Lexi find her own normal. Being friends with Ryan and joining drama, even the beginning of a relationship with Marcus. While I would normally say that love doesn't really fit into a story like this, it's perfect in All We Could Have Been. Lexi needed to find someone that she truste, felt comfortable with, who didn't turn away when they found out the truth. Marcus doesn't have the most normal life either, so he was perfect. Lexi could start feeling normal and start to trust again. I think my favorite part of this book was seeing Lexi grow. Starting to come to terms that she is allowed to live her life. She isn't responsible for what her brother did and shouldn't feel bad for wanting her own normal. Just because something awful happened, that doesn't define who she is. Lexi is her own person and gets to be happy. Let me start by saying that, All We Could Have Been is not the type of contemporary story that I normally read. I usually stick with the cute romance stories that, although they deal with real-world issues, generally stay pretty light with heavy doses of humor. So why did I pick-up All We Could Have Been? I can’t fully explain it. I think a big part of it is that my curiosity got the better of me. I’m not usually big into mysteries, but for some reason I just really needed to know what the “heino Let me start by saying that, All We Could Have Been is not the type of contemporary story that I normally read. I usually stick with the cute romance stories that, although they deal with real-world issues, generally stay pretty light with heavy doses of humor. So why did I pick-up All We Could Have Been? I can’t fully explain it. I think a big part of it is that my curiosity got the better of me. I’m not usually big into mysteries, but for some reason I just really needed to know what the “heinous crime” that Lexie’s brother committed was, and how it caused her to develop PTSD. I’m so glad I gave this book a chance! It grabbed me from the beginning, and held on tight all the way to the end. I cared for, and rooted for Lexie right away. One of the things that this book tries, and I believe succeeds in conveying to us is that it’s not just a victim’s family that suffers when something tragic occurs. What Lexie’s brother did (and I won’t spoil what it was, because this book does a great job of building the dark mystery, by throwing little bread crumbs here and there), inadvertently did a number on Lexie. Lexi is always the new girl, always starting over thanks to her family's situation and her dead brother. Only this time she's with her aunt and not her parents. In her latest town she needs to finally make it through a whole school year to get to stay there and make friends and her grades. As she makes friends with Ryan and gets a feel for her new school, she even wants to join the drama group and perform in their production or Romeo and Juliet. However a slip of the tongue and her real name and pa Lexi is always the new girl, always starting over thanks to her family's situation and her dead brother. Only this time she's with her aunt and not her parents. A story about discovering love, friendship and how to deal with grief when it hits full force. In the book we see how one person's actions can destroy multiple lives and the impact of devastating actions on the family in this novel are severely moving and sadly understandable. It was a gripping read and was a great book about rebuilding a life and becoming you again. Rounding up to 4/5 because I may have been expecting too much from this one. I loved Carter's first book I Stop Somewhere. It was the kind of book that made you feel something, and kept you on an emotional roller coaster from start to finish. Because of that, I expected this book to be equally enthralling if not as dark. I liked this book. The story was interesting and the emotions were real. My only real hangups were Ryan's severe and totally selfish reaction to her secret, and her subsequent dep Rounding up to 4/5 because I may have been expecting too much from this one. I liked this book. The story was interesting and the emotions were real. My only real hangups were Ryan's severe and totally selfish reaction to her secret, and her subsequent dependency on Marcus. It all felt a little juvenile and unrealistic (this coming from someone who reads almost exclusively YA). Wow! I truly was not expecting to like this one as much as I did! I have no idea why though because it was unlike anything I've ever read before. Yes it is a contemporary, but not a romance heavy or mental health heavy one. It wasn't a thriller, but has thriller-like elements? Point is, it is hard for me to categorize it because it pulls from a lot of different themes instead of focusing on just one. When I first read the synopsis, I was thinking there would be thriller elements because of the cr Wow! I truly was not expecting to like this one as much as I did! I have no idea why though because it was unlike anything I've ever read before. Yes it is a contemporary, but not a romance heavy or mental health heavy one. It wasn't a thriller, but has thriller-like elements? Point is, it is hard for me to categorize it because it pulls from a lot of different themes instead of focusing on just one. When I first read the synopsis, I was thinking there would be thriller elements because of the crime that was committed and then I thought maybe there would be a lot of criminal justice work present as well. I was wrong on both accounts and I am so glad. What really made this book unique is it focused on the girl that was left behind in the aftermath of an incredible crime that was committed by one of the people she loved the most in her life: her brother. The book did not focus on the crime itself or the people that the crime directly affected, but solely on the sister and family of the criminal. I was so so fascinated by Alexia's story that I just could not put it down. It made me ask myself questions like: How would I act in the aftermath? Would I still love my brother? Would I ever be able to move on? Carter meshed crime, guilt, depression, self harm, bullying, romance, and high school drama together and created a beautiful book about how to accept things that are out of our control and how to move forward once we do. TE Carter’s All We Could Have Been is an inside look at the effect that other people’s—particularly family—choices can have on you. Particularly relevant for young adults, it shows some of the many faces that grief can take on, especially in the context of high school, a difficult environment for many to begin with. The book touches on grief, abandonment, the cruelty of teenagers, and the relationship between family members. It was interesting, but not riveting, and hard to categorize. It was fu TE Carter’s All We Could Have Been is an inside look at the effect that other people’s—particularly family—choices can have on you. Particularly relevant for young adults, it shows some of the many faces that grief can take on, especially in the context of high school, a difficult environment for many to begin with. The book touches on grief, abandonment, the cruelty of teenagers, and the relationship between family members. It was interesting, but not riveting, and hard to categorize. It was full of shame, guilt, and a pinch of hope. And what a complex, poignant read it is! T.E. Carter explores the multiple, heavy ways that trauma and violence can shape and mold a person in their aftermath. These characters are complex and beautiful in their flaws--proving that even the kindest of souls, even those with the best of intentions, sometimes take paths of unnecessary cruelty. The fact that T.E. Carter does not try to justify that cruelty, does not try to "tidy" everything up in the end, only proves that she has an insight into human nature that most of us are too hopeful to acknowledge. There are things you don't get to escape. There are things people won't let you forget. No matter how much you tell yourself it's okay. No matter how much you want to believe there's a tomorrow where yesterday isn't always looming. There are some things that shape every minute of forever. There is a quiet, subtle plot woven throughout this book--because this story, in its essence, is more focused on the growth and learning of its characters than any action or events. The mystery is slow to unravel, leading readers down a nonlinear progression of memories and backstory, allowing us to more fully enmesh ourselves in Lexie's mind. Don't let yourself become complacent in your reading, though, dear Penguins--this book will change your outlook on a lot of things, if you allow it. Actual rating: 2.5, but rounded up to 3 due to the second half of the book. I was VERY excited to read this book based on its premise AND the premise of Carter's earlier work I Stop Somewhere . Sadly, I was disappointed. I was hoping for something amazing, something to keep me wondering about humanity, and choices, and what it means to be family. Instead I got something that Many thanks to NetGalley and the publisher for providing me with an eARC of this title for review. All opinions are my own. I was VERY excited to read this book based on its premise AND the premise of Carter's earlier work I Stop Somewhere . Sadly, I was disappointed. I was hoping for something amazing, something to keep me wondering about humanity, and choices, and what it means to be family. Instead I got something that felt generic even though it shouldn't (I mean, how generic is having a killer in your family?) and flat. My main complaints stem from the fact that much of the story seems to take place only in Lexi's head, meaning all we get is her internal monologue. There is very little action, which means this story rests on the characters. And they are flat. Lexi felt whiny, the side character of Ryan is underdeveloped, the issue with Rory is unexplained, and the relationship with Marcus is TOO EASY to be believed. With a conflict centering on the fact that Lexi starts over every year, there is no real rationale for it and the parents, people who should be central to this conflict, are amazingly flat. Five years ago Lexie walked home from school to find out that her brother Scott had committed a heinous crime. Ever since, Lexie has been on the run from all the rumours and horrible treatment that she received as a result. Treated like a criminal herself Lexie has moved to different family members each time her “dirty secret” has come out. This year she’s determined to complete her senior year, just 162 days, at one school and just blend in. Will this time be different? This book puts into focus Five years ago Lexie walked home from school to find out that her brother Scott had committed a heinous crime. Ever since, Lexie has been on the run from all the rumours and horrible treatment that she received as a result. Treated like a criminal herself Lexie has moved to different family members each time her “dirty secret” has come out. This year she’s determined to complete her senior year, just 162 days, at one school and just blend in. Will this time be different? This book puts into focus what the repercussions are for the family members of the criminal. When the reality of Lexi's past came to light, I was taken by surprise -I came to my own conclusion as I didn’t read any other reviews or any extended blurbs. The way that Lexi's trauma was written felt so real and I couldn't help but feel for her . The author has done a brilliant job with the way she has written this story. You are taken on an emotional roller coaster and you do get sucked in while reading. The characters are relatable and display a whole range of emotions that will stick with you even when you’ve stopped reading. This review has been hidden because it contains spoilers. To view it, click here. The second novel from Carter, All We Could Have Been follows the character of Lexi as she begins a new life, once again in a new town and her life over the bext 162 days as she figures out who she is and what she wants and does it brilliantly. (Spoilers, ahoy!). I am not a romance person, however this book does romance in all the right ways. Touching and poignant, it’s so tenderly written in this book as she finds love in what some might call the wrong people in Marcus but it’s just so deliciousl The second novel from Carter, All We Could Have Been follows the character of Lexi as she begins a new life, once again in a new town and her life over the bext 162 days as she figures out who she is and what she wants and does it brilliantly. (Spoilers, ahoy!). I am not a romance person, however this book does romance in all the right ways. Touching and poignant, it’s so tenderly written in this book as she finds love in what some might call the wrong people in Marcus but it’s just so deliciously done. Growing and building throughout the book as she figures out her friendships and those she loves, Lexi is a complex character with real and honest feelings and I love this book for it. The plot that sees Lexi moving so much and her relationship with her brother is done just as well. Lexi and her brother haven’t met since he was sent to prison in this book and how she explains the impact on her life of what he did, and it feels sometimes like it’s happening in real time, because I can imagine this would be how someone would react to what has happened to them. This whole story really works together beautifully throughout. The pace of this story was painstakingly slow and it quickly made me lose interest. I find this book to be pretty cliche to me even though the main character is going through a difficult time with guilt, feeling helpless and hopeless. I really hoped that even throughout the end, Lexie wouldn't be treated so badly by the ones whom she considers to be her friends. She doesn't deserve to be treated this way especially after going through so much. They should be consoling and comforting her because The pace of this story was painstakingly slow and it quickly made me lose interest. I find this book to be pretty cliche to me even though the main character is going through a difficult time with guilt, feeling helpless and hopeless. I really hoped that even throughout the end, Lexie wouldn't be treated so badly by the ones whom she considers to be her friends. She doesn't deserve to be treated this way especially after going through so much. They should be consoling and comforting her because knowing that she has gone through all that, those who purposely hurt her are really inhumane. There's really no hope for them anymore. I wish that the author would have elaborated even further for Lexie's future and even what she plans to do after finishing high school. It may be the last thing on her mind but I find that it will make the readers feel assured that she's moving on with her life and leaving the demons behind her. The ending was really abrupt too and a bit unresolved. It ended just like that. 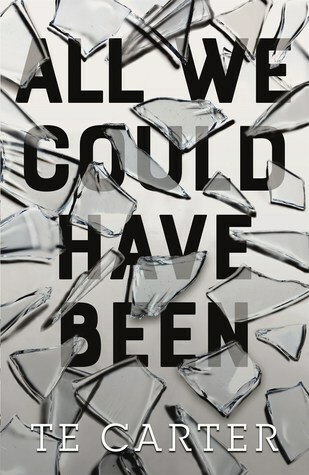 "All We Could Have Been" by TE Carter has been one of my most anticipated books of 2019. And to be honest, it lived up to the hype. We follow Alexia as she tries to figure out her place after discovering her brother moments after he commits a heinous crime. At the time, she was a child and now into her teens, she is still struggling with accepting her brother and understanding her part in his actions. TE Carter writes from a place that I have never experienced. You can feel the emotions of the ch "All We Could Have Been" by TE Carter has been one of my most anticipated books of 2019. And to be honest, it lived up to the hype. I feel like this book was written by a completely different author than "I Stop Somewhere". The characters were dull and I didn't feel a connection with any of them. The plot sounded interesting but that also fell flat for me. I really could not get into this one, which is so disappointing because "I Stop Somewhere" was so amazing and I was really looking forward to another book by this author. I will still be on the lookout for I received a copy of this book from Netgalley for an honest review. Great YA title with a well drawn main character. I spend through it and was pleased that it is not graphic YA in any way although there is a little bit of swearing. I did feel a bit lectured at at times, as if the writer did lots of research and thinking about people in this situation (no spoilers!) and wanted to cram everything in. So there is plenty of internal voice but I wanted more of the other characters too. I like the hope in this book and it was very readable. Thanks to Netgalley for an Great YA title with a well drawn main character. I spend through it and was pleased that it is not graphic YA in any way although there is a little bit of swearing. I did feel a bit lectured at at times, as if the writer did lots of research and thinking about people in this situation (no spoilers!) and wanted to cram everything in. So there is plenty of internal voice but I wanted more of the other characters too. I like the hope in this book and it was very readable. I liked this book a lot. The story revolves around Lexi, a girl whos running away from her past and hoping that no one finds out the secrets that keep on haunting her. I really enjoyed her character as she was so layered and real which even though she was living with things that the average person isn't made her a relatable mc. This was really good! My full review will be up on 4.13.19 for the AWCHB Blog Tour hosted by Fantastic Flying Book Club blog tours!